The White House issued a directive Friday morning stating that those of the congressional delegation may not travel via government aircraft, nor seek government coverage of travel expenses during the shutdown without express approval from the White House Chief of Staff. 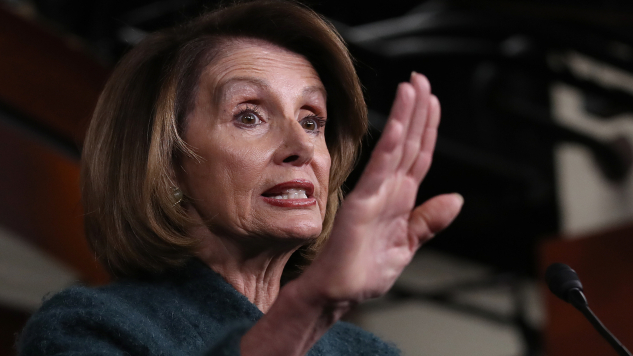 The charge comes not 24 hours after President Trump canceled House Speaker Nancy Pelosi’s trip to visit troops in Afghanistan. On Thursday, Trump abruptly canceled said trip, on which Pelosi was scheduled to visit troops, citing the ongoing shutdown as his reason for the cancellation. In his letter to the Speaker, Trump wrote, “Due to the shutdown, I am sorry to inform you that your trip to Brussels, Egypt and Afghanistan has been postponed. We will reschedule this seven-day excursion when the shutdown is over.” The trip had been previously unannounced due to security concerns. “Obviously, if you would like to make your journey by flying commercial, that would certainly be your prerogative,” the president added. A senior White House official denied that the letter has any relation to Pelosi's request that the president delay his State of the Union address. But, does it really have all that much to do with the government shutdown, either? “In light of the 800,000 great American workers not receiving pay, I am sure you would agree that postponing this public relations event is totally appropriate,” Trump continued in his letter. Yet mere hours later, reports surfaced that First Lady Melania Trump had jetted down to Mar-A-Lago, Fla., for the holiday weekend. On a government plane. At an estimated cost of roughly $35,000 to taxpayers. It would seem that a Florida excursion fits into the president's definition of “totally appropriate” travel expenses. Eyebrows are also being raised following news that Senator Lindsey Graham (R-S.C.) recently arrived in Turkey, where he is meeting with President Erdogan. It is unclear yet whether the senator traveled commercially or via government aircraft.